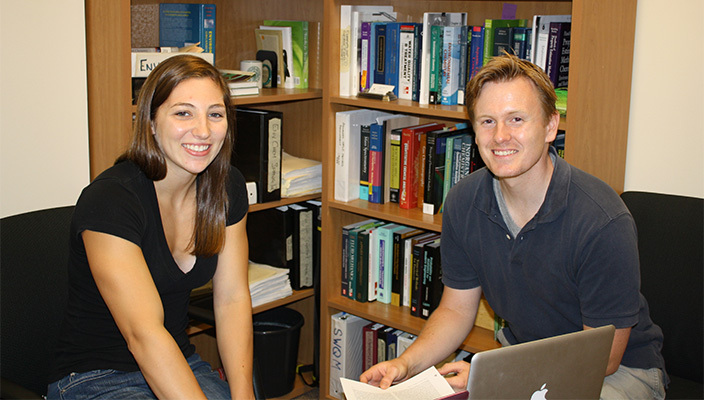 Through the newly-established Lister Summer Fellowships, three Hofstra University Honors College students were given the opportunity to stay on campus to work on individual research projects June-August under the mentorship of a Hofstra chemistry professor. The inaugural Lister Fellows are: Faith Fowler of Issaquah, WA; Amanda Stashin of Massapequa, NY and Edward Zhou of Poughkeepsie, NY. Senior Faith Fowler is pursuing a BS in Forensic Science and working with Professor Ling Huang on research geared toward law enforcement and its ability to quickly analyze emerging synthetic designer drugs. 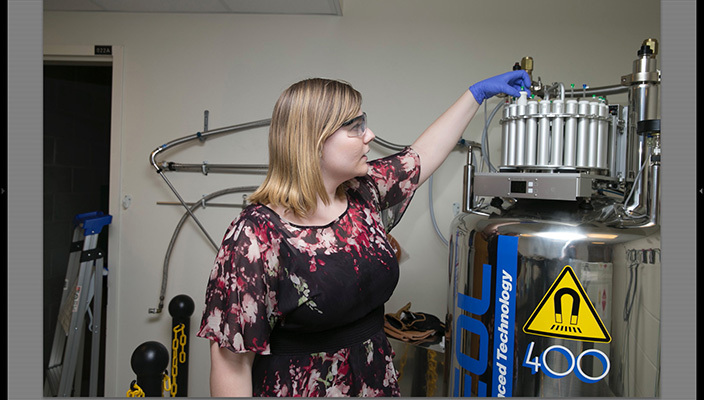 For her work, Faith has access to a state of the art nuclear magnetic resonance (NMR – pictured above). In her proposal, Faith wrote, “The availability and use of designer drugs in America has increased greatly over the past several years. When drugs are very new, and when a crime lab is charged with identifying and quantifying substances, they are often unprepared and may have difficulty in their analyses.” In addition to the NMR, Faith and Dr. Huang are also developing methods using Gas Chromatography/Mass Spectrometry Analysis (GC/MS) (which is what most crime labs are currently using) and high-performance liquid chromatography. Senior Chemistry major Amanda Stashin is working to characterize the metal composition of residential street sediment and its potential to make its way into Long Island’s natural waters. 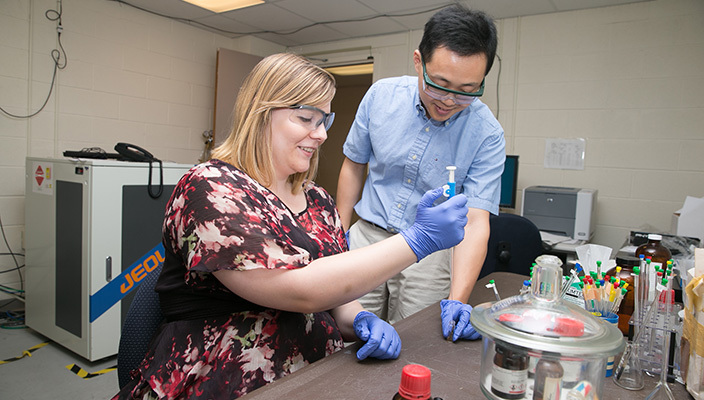 She is working under the guidance of Professor Kevin Bisceglia and developing protocols to measure levels of lead, arsenic, and other heavy metal carcinogens. 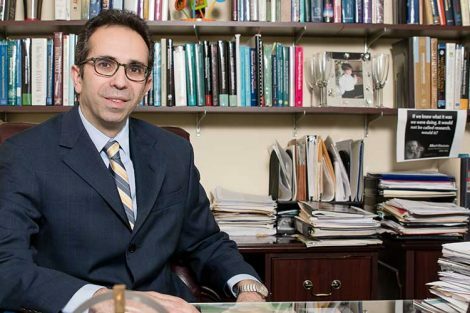 There is a tendency, says Dr. Bisceglia, to think that street sediment across all municipalities would be the same, but factors such as frequency of street cleaning, land use, density, and traffic patterns can lead to vastly different chemical composition and environmental impact. State of the art instrumentation for analyzing specimens has just recently arrived in the Chemistry Department, and this will allow Amanda to continue her research through the fall semester and possibly spring 2015. 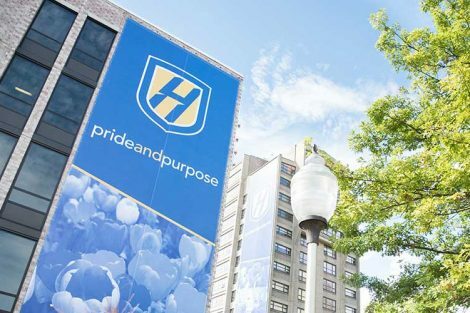 Amanda and Dr. Bisceglia research are working in cooperation with Hofstra’s Sustainability Studies Program and School of Engineering and Applied Sciences. Senior biochemistry major Edward Zhou, who has been working with Professor Emily Mundorff since his freshman year, is studying a family of enzymes, haloalkane dehalogenases (HLD), which have properties that may be used to clean environmental pollution, decontaminate chemical welfare agents and manufacture other chemicals. Edward’s research involves identifying members of the HLD family and expanding understanding of HLD enzymes. 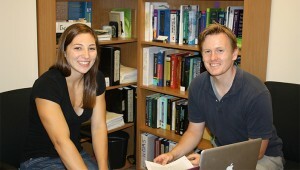 Edward is president of the student chapter of the American Chemical Society on campus. He is in the 4+4 Program (BS-BA/MD) which will allow him to enter Hofstra North Shore-LIJ School of Medicine after he completes his undergraduate studies. 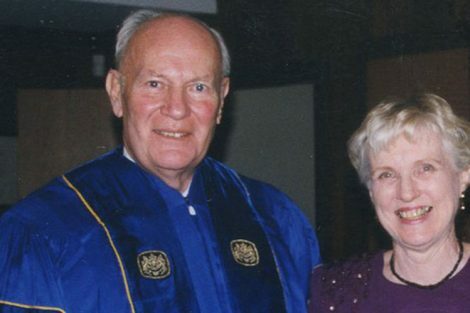 The Lister Fellowships were made possible by a $250,000 gift from Dr. Bruce Lister and his spouse Doris Lister in 2013. “Science majors often cite cost and the need to obtain summer employment as a reason they cannot spend more time on research work in their field of study,” said Dr. Lister, who wants to help alleviate that burden for promising young scientists. 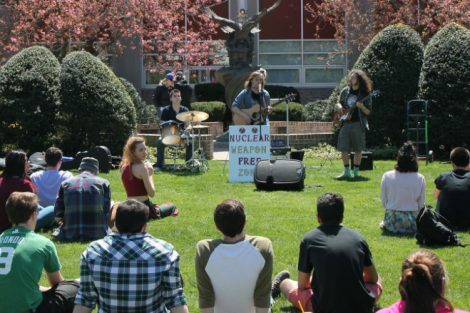 The selected students received a $3,500 stipend and a grant to cover 50 percent of their on-campus housing costs. Students are selected as Lister Summer Fellows on the basis of academic achievement, research potential and demonstrated interest in pursuing a career in science research. The three fellowship recipients will write a report about their research and participate in a public presentation of their work during the Undergraduate Research Poster Session in December 2014.